Step onto the foot rests and grasp the handles. Move into the starting position by pressing until the arms are extended. The legs should be suspended from the ground. Lower the body until the chest is level with the bars or until the upper arm is parallel with the floor or as low as is comfortable, inhaling throughout the motion. (Be sure to lower slowly so that shoulder injury does not occur). Press the body upward until the arms are extended, exhaling throughout the motion. Repeat steps 2-3 for as many reps as are desired. (Sets should generally fall between 3 to 6 with 6-12 repetitions). 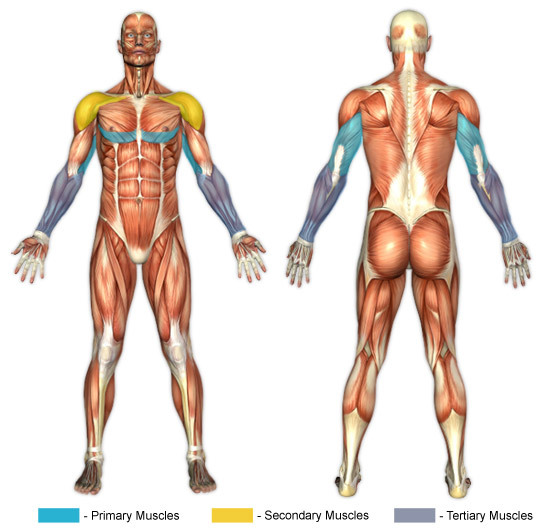 Angling the chest forward will isolate the inferior chest fibers, while angling the body upright (vertically) will isolate the triceps more. Dips considerably stretch the pectorals and the shoulders. As such, it may be prudent for beginners to use other machines, like the assisted dip machine, to gain strength and confidence before attempting unassisted dips. Assisted dip machines (which can often also be used for pull ups) allow for easier dipping by means of a pad that goes under the knees which is attached to weight plates. They work by removing a portion of the body weight, basically like an uneven counterbalance (assuming that the pin is not set at the same weight that one weighs). Using such machines is a good way to transition to unassisted dips. Weighted dips are an excellent way to increase the difficulty of the exercise. There are a couple different methods that can be adopted. One method is to simply squeeze a dumbbell between one's legs or feet during the dip. For obvious reasons, this can prove to be quite a troublesome (and hazardous) task. Consequently, many people who desire increased difficulty use dip belts. These devices are specially designed for dipping. They work by allowing one to attach weights (via a chain) to a belt, which thereby transfers weight to the body. Hence, the difficulty is increased by how much weight is attached to the belt. Dips put tremendous stress on the shoulders, so caution should be undertaken. People have different levels of flexibility and comfort, and as such each person should gauge how low they can safely dip. As a general rule, dipping until the chest is level with the bars is sufficiently low. Only dips as low as is comfortable. The elbow tendons and joints are also heavily stressed, especially when done with additional weight (using a dip belt).